The Launch Pad: What is Happening at the Kennedy Space Center? What is Happening at the Kennedy Space Center? The DC industry network is quite fun and interesting. Even though I live in California, once in a while I get to be part of the DC networking events. On Thursday, July 24, the Space Transportation Association put together a lunch where Bill Parsons, Director of the NASA Kennedy Space Center, talked about the current and future status of KSC. The lunch was very well attended and it was a great to see the DC faces I don’t get to see everyday. While there are still 10 shuttle flights left it appears that the center is getting ready for Constellation. Bill Parsons commented that they will be building a new platform as well as implementing a new crew escape system. Apparently this new crew escape system better than any six flag or Disney World ride!!!!!! Work will be done in Pad A since this will be the pad launch for Aries V. Pad B, on the other hand, will be used for the launch of Aries 1 and the crew vehicle. Work has been done to pad B and therefore it already has a new lighting system. Congress gave KSC a decent amount of money to help fix the Vehicle Assemble Building because of all the damages it had suffer due to Hurricane season. The VAB seems to be in pretty good shape and therefore it will be used to assemble the vehicle during the constellation program. 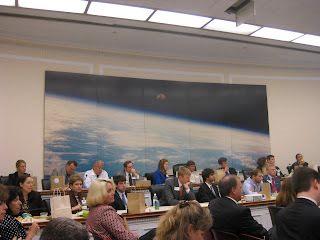 I was a little surprised to hear that KSC still plans to use the “crawlers” to transport the vehicles out to the pads. I have never really been a big fan of those slow crazy looking Star Wars machines!!!!! And well I was hoping that NASA could come up with something more effective and better looking!!!! According to Bill, KSC is still running like it has been on the past years and KSC won’t see a change in work force until next summer. 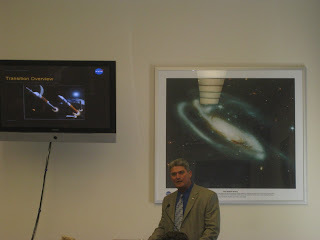 It was nice to get an update on what has been going on at KSC and what its future holds. KSC is a wonderful place to visit and even though both the place and the people will have to overcome some changes in the near future, I recommend all of you go check it out and be part of a shuttle launch while you can!!! !